I feel that I need to write a detailed response to the comments and feelings with regards to the idea of guiding Bob Graham Round's for work. Firstly, I'm really sorry to all folk that don't like this idea and if it has upset or aggressed you, then this was not the intention. Some history: I am a local guy, not born, but certainly bred in the Lake District. I have grown up in an outdoor shop (literally) in Windermere, which in its hay-day was a hub for skiing, walking, climbing and camping through the 80's, it went through many changes over the 35 years it was in existence and finally closed in the Winter of 09/10. We kept an online presence and this still exists today. I have grown up using the fells on a regular basis, skiing on Kirkstone Pass since I was 5 and learning in my life to climb rock at 11, sail from 13, walk and camp since I can remember and generally have been immersed in the Lakeland Fells for a life time so far. The fells are part of me and I am part of them. 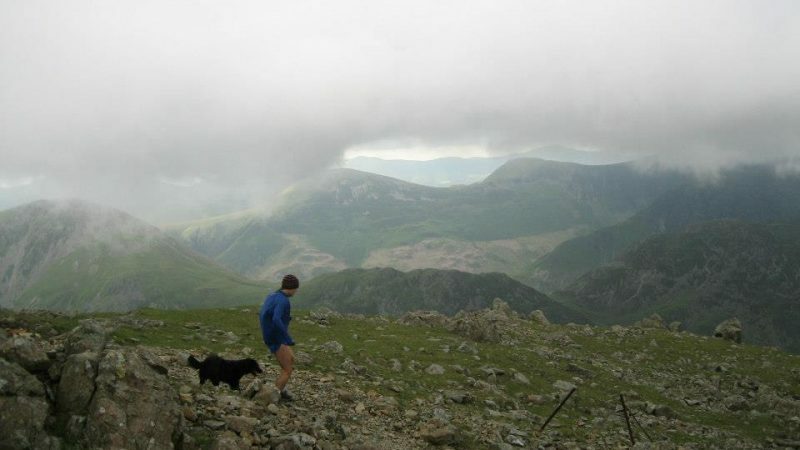 I started running in 2001, when I moved back to the Lakes from London. My father was a fell runner and it suited me to the ground, the freedom of just a pair of trainers, shorts and a tee-shirt was unrivalled and I fell in love with this form of travel through the Lakes and other mountain ranges around Great Britain and Europe. At the same time I took up Winter Climbing to add to my skill base. I was given a copy of the original Bob Graham history and round booklet by my Dad in 2005 and reading this great little booklet in bed I knew this was my calling, so I set too training the following January, for MY BGR. I didn't want to ask the club, I didn't know anyone in it really. I didn't have the same self-confidence I now have and I was a lone fell runner, enjoying the company of my dog (Scratch) and occasional friends. I was by now already a Mountain Marathon runner, possibly the purest form of fell running available (outside just going for a run) and wanted to adopt the same approach to the BG as I did with MM events, so with my good friend Chirs G, we hatched plan to train together, pick a date and run the round with minimal or no support. I was encourage by friends in the 'outdoor trade' that I had the grit and skill to do it this style or even solo, so gee'd on by their kind words I thought this was more than feasible. Chris didn't manage to keep his training going, work got in the way. I got fitter for the time I was training, won the B Class in the LAMM that year and decided I might be fit enough to go for an attempt myself. This was 2006. I had only run Leg 1 once, done half of Leg 3, but had covered much of the ground running or walking other routes and similar ground so had an understanding of the terrain and general route. I didn't use the Bob Wightman facility, as I figured this wouldn't be MM style. This was MY Bob Graham, it was my choice. In 2006 there were very few tracks if any. Nothing coming off Skiddaw, nothing on Great Calva, I didn't know the way up Bowfell and worked this out on the top of Harrison Stickle (on route) and I didn't know any of the other short cuts, I just worked it out on the move, taking what I thought was the best line on the day. Chris knew a line off Yewbarrow, he'd view the Bob Wightman sight, unknown to me until we were up there. Chris supported the road stops, ran leg 1 with me, half of leg 4 and then from Newlands to Moot Hall. 2 friends guided me on the final leg 5. I was shot, but they made light work of it and I finished in a time of 22:49 on a semi supported round. I did legs 2, 3 and half of 4 (from Great Gable) with just Scratch, my faithful dog, who incidentally was the 6th dog, according to 'Feet in the Clouds' (another source of information and inspiration), to complete the round. He was a legend. In between this time I have supported many BGR's for friends and friends of friends, I have been happy to give my time to help these runners get round the set route, some in summer, some in winter. I have never asked for any help in return, but I may well in time to come. 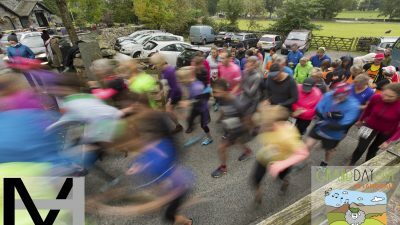 I have completed a 'Classic Rock Round - think Ken Wilson and Classic Rock - in the Lakes, less than 20 people have done this. This was done in a clean style with my friend Mike E. We did it completely un-supported, as this is the style done by others and clocked a time of 22 hours if my memory is right. This was in 2012. In 2012 my online website went under and we closed it down. This left me in the position of whether to get a job or try to forge a living using the mountains that have enriched my life so much. I have been in the lucky position to enjoy this environment and learn my skills either from piers or self teach. I wanted to use this knowledge base to earn money and let others enjoy the mountains, as I have for so many years. I understand my life is a privileged life. 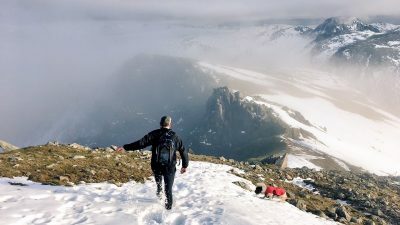 This idea to guide BGR's, with a family of 3, will never make me a millionaire, but then I have never really been interested in this, I am happy to live where I live and enjoy the mountains over the top of everything else. I had thought about this on occasion and never put it into action, for reasons of costs, I thought the reality would be too expensive for others, and we base mainly our opinions on our own spending patterns. I was surprised earlier in 2005 when someone contacted me to guide them on the round and teach navigation at the same time. This would have been over 3 days. They would have then gone onto complete a round. The person in question, I'll name him John for this article, advised the cost was too much and he would enlist friends to help. Fair enough, no problems there. 'John' then came back to me many months later and asked me if I would 'guide' his round. He still hadn't learn his navigation skills, he didn't have the network of friends and helpers and didn't want to use the BG Club network. I advised this was the standard method and asked why didn't he want to use this support network? His answer was that he didn't want to feel like he owed anyone anything and with a new baby on the way, he didn't assume he would have the time to 'give back' to the community. We discussed some costs, we went out for a preparatory run to gage his fitness, skill, tenacity and understand each other a little better. We agreed he was capable and set a date. He trained well and on the week prior to the set date I started watching the weather. A storm seemed set to roll in on the projected date. I spoke with John and advised we might need to move the date. He advised me he wanted to do it anyway, as the baby was due soon. He knew there were no guarantee's that we would get round, all this had been previously discussed. I had 2 guides ready, on top of myself, who are also local and had agreed to this service. Neither of them saw this as a problem. 2 days before the round and the weather looked set to be atrocious. I spoke with 'John' and advised we should postpone, as completion did not look likely. I spoke with one of the guides who was helping and he agreed. 'John' did not agree and said he understood we might not complete, but he would like to try anyway, as it was his only chance, pre-baby. I offered advice that there was always the following year etc, but he wanted to do it anyway, so we kept to the plan and set off at the allotted time. John and I battled serious weather for 2 legs and on leg 3, when the other guide was due to take over, he advised he would not guide in the conditions at hand, as they were worsening and were due to continue like this for the next few hours and the attempt would likely not make Wasdale. We pulled on the round at Dunmail for safety reasons. This idea now floated in my mind a lot more and it seemed a reality. I spoke with Damian sometime last year at an event somewhere, possibly the Dragon's Back Race and we agreed I would guide him, he would write an article. Damian is a Journalist who makes some of his living from taking part in events and writing about them. We agreed a date last December and when the month came we spoke at length, got on with the round in a pure-ish style, with minimal support, he carried his kit, I carried mine, I navigated, Damian offered moral and physical support. We completed in 21:57, only 6 weeks after Damian had set a new record for the SWC path. One article went live in Women's Running, then more recently it has been featured in Outdoor Fitness. I have been receiving enquires, generally from either the south of Britain or abroad in Europe. This was what I expected. At no point have I assumed this would devalue others rounds, or even bring into question whether a round should be ratified with the '24 Club' or not. Lets just be plain about the style of a guided round now after all the back ground detailed already. I am a solo operator, with a few guides I can call on, should I need their assistance and assuming they are free to work. I don't envisage 'big trains' being guided across the route. I am not trying to set up a new network that supersedes the 24 Club and its network. I am offering a 'bespoke' guiding service for those who want to take me up on it. I have looked at the costs and fitted the prices in around this costing exercise and I am certainly not trying to make this my only income. I assumed I might get 1 to 2 clients a year who would like to take this service, its another string to my bow of offerings from a busy solo operator for a personal goal for those who don't want to use the BG Club's network. The rounds would have a low key feel to them, not some high profile glitzy feel. They would be very personal. I have seen plenty happen in the Lakes since I have grown up here (from 18 months old), I have been part of the 'outdoor hub' all my life. When I completed in 2006, there was not a path around any of the BG, only on the sections that had a path already from other fell use! 10 years down the line there is a path off Skiddaw, a hi-viz sticker to help you find your way over the fence, there is a path down to and over Hare Crag, there is a path across the bog below this, there is a 'motorway' up Great Calva and a path down the fence, we straight-lined it through the heather slopes directly to Mungrisedale Common, there is a path off Seat Sandal, there is a path up Steel Fell (in 2006, this was only evident in the final upper section of the gully), there is a semi path up Mere's Beck, there is a path with 'cairns' up Bowfell and I could keep on going. This is the price of the BGR becoming more popular and then on top of its popularity its the price of the continual recce-ing that takes place. Several years ago this angered me greatly, I felt I should write an article on the constant recce-ing of the route, that is causing this 'environmental damage', then I realised I was wrong and realised I had been depressed in my life while thinking this and I basically got over myself and my own anger. I realised everyones idea of completing the BGR is very personal, like mine was. My running partner for that day is now dead, its a real shame, as he was the best running partner you could ever have, he was my dog..... anyway, less of the digression. Environmentally what I propose is good. I don't propose that folk from the far reaches of the UK, be that Scotland or London travel to the Lakes weekend after weekend to work the route and get it mapped in their heads. This type of travel, if we want to be 'environmentally sound' about the whole affair is not really that great. It creates plenty of exhaust fumes, it creates plenty of rubbish to enter land fills (unless you are really conscious and make all your food, bring all your water in re-useable bottles etc) and it creates damage over the route that folk care so greatly about. I believe a BGR is possible for all, some need to run the route, others need to only have the skills in place, the fitness built and the tenacity and confidence to give it a go and can practice on other terrain, saving the cherry on the cake (being the route) for their ultimate prize. I believe you can train where ever you live, get a good background in the mountains with a multitude of races and personal challenges and then apply all this to YOUR BGR. Damian Hall is a good example of this, so am I. Environmentally I offer some relief to the route, but in all honesty this will make no difference, as the numbers I will guide will be minimal to the number of folk approaching it in the traditional way. On top of the traditional approach, some fell running clubs have run 'trains' of aspirant completer's across the fells, using 'chalk' dust markings by way of keeping them on track. I'm quite sure some of the 24 Club is made up of some of these successful completions. Then there are the rounds which have had literally teams of supporters on route, having a jolly. I may well be opening the way for others to follow and offer guiding on a mass scale, but to be honest, I hardly think this is a reality. How many folk do we imagine have the time and mental/physical focus in themselves and their lives to complete the BG? Not huge volumes, the route is tough, the ground is rough and the ascent and descent is massive. Its a niche thing now, that has grown in popularity, but its not all of a sudden about to explode into a mass market completion, just because I am offering a guided service. I am not interested in this style. Some may question my ethics. I really can't help this. I'm not using the 24 Club to promote what I am doing, so I'm not making any attack at the club or trying to piggy back their volunteer status. I have an old family friend who is on the committee. I saw him in a supermarket post my round with Damian, he congratulated me on my efforts and I told him then that I was thinking about offering a guided service and that the round I had just done would appear in a magazine article. He is one of the only 'real' (if you are to be picky) winter round completer's and said to me he didn't think it would be an issue. Put into context, this was a 2 minute conversation, not a commendation from the 24 Club or its committee. I feal I do not need to justify what I am doing, yet I find myself writing this article so people can understand my motivation. Some folk don't like it and have professed this on Mountain Run's FB page, the Bob Graham Club FB page, of which I'm not a member, but have been forwarded some screen grabs so I can see what has been said. Plenty of folk have been positive about this idea, but lets not forget, it really has little to do with what others think, its a personal commitment between a guiding professional and their client. I have been picked up on being 'just' a Summer ML and that this is not a guide qualification and that others hold this qualification which is very true. I am not professing to being a AMI Mountain Guide, I am a Mountain Running Guide, with plans on growing my qualifications, but in the time I have been accessing the mountains, which is since I was a kid, I have grown in my knowledge of situations and experience greatly, through a multitude of pass times, sports, skills, epics, failures and successes. Guiding has been common place since Fell Running was born, but more so to do with mountaineering in either the UK or abroad in Europe where is became known as Alpinism. The original fell races were completed by guides in the Lake District, wagered by their employers as to whether their guide could reach to top of the fell and get back down again before the other 'Gentleman's' guide. Guiding is more common place now for walking, mountaineering, winter climbing, rock climbing and much more. Running guiding is less common but there are a few of us dotted around the country. There is a vast number of folk who don't have the skills to enter the mountains safely, but do so on a regular basis and being able to take advantage of a guide reduces the inherent risks, especially in winter. The Bob Graham is steep in history as we know and is the iconic extension of the most fells collected in a 24 hour period. There is absolutely no reason, ethical or not, why someone shouldn't guide people for money, assuming there is a market there to benefit from. Doing the round this style doesn't make it any easier. It shouldn't take away any of the experience or status. Most rounds are 'guided' in some respect, many folk not knowing where they are going or ever looking at a map, many folk don't carry their own equipment, but this should not be an issue, as it should be up to the individual attempter to chose their style, without being frowned upon. Is it frowned upon to be guided up Tower Ridge on the Ben? Or a multitude of other examples? Personally I have been lucky enough to put in the apprenticeship to climb iconic routes such as Point 5 Gully, the Orion Face Direct and more. I did this on-sight, with Point 5 being the first time I ever used crampons or an ice axe and ice screws. This doesn't make my ascent any the more real to the person who employed a guide to help them achieve this experience. My ascent was just different. I might claim it to be a more 'pure' style, but that is just my ego massaging itself at the end of the day. What I am offering shouldn't detract from others achievements, they are all just as valid. Does it make me better that I on-sighted much of the route? Does it make a friend of mine much better that he on-sighted most of the Charlie Ramsay in winter conditions solo? No, its just personal to that person. Others might be in awe of that style, but it doesn't take away what they have or are about to achieve. This should run the same if someone feels they want to employ a guide, someone with vast experience, to help them find their way around the route and hopefully complete. I am a member of the BG 24 Club now, from the round I did this year. I am not sure how my idea sits with the committee, but if there is an over whelming feeling that I should not be a member because I want to offer guided 'paid for' low key rounds, then I am happy to relinquish this. Well, happy is not the right description, but I never did my rounds to get in the club, I just did them for myself. It would be a shame if the club stopped those clients from being able to be part of this club, just because they used some 'numbers' they had earnt through employment to help them achieve this iconic route. Why should they not be able to train on their home terrain, make some visits to the Lakes and then take advantage of a service provided? Some other friends of mine have taken flack for offering Navigation Courses for runners, putting on other types of running events outside of the fell running scene that cost more money and are run as a business, yet this is not wrong. You can teach yourself navigation, you can teach yourself yourself to run in the mountains (some do find it harder than other's with these skills), you can learn to climb by yourself and the list keep on growing indefinitely, but some chose to give numbers (very important to understand this, money is just numbers, we just happen to need them to feel comfortable in this plane of existence) to someone else to gain from their experience and ultimately learn from it. How is this a problem for others? We are all quite happy to go to a pub and buy beer, but you can brew it at home for next to nothing. Its the same with everything else. The problem in my mind is perception. Peoples perception is how they have done something, as that is their perspective, but if you move your mind to someone else perspective, then maybe you can see the difference and try to understand. What I am offering is not to detract from others achievements, its not to take anything away, neither am I looking to guide 'trains' of individuals around this wonderful route that takes in the whole of the Lake District, I am offering a personal and bespoke service to a handful of possible clients. And at the root of this, my service will only exist should others want to take me up on it. Please understand, I am not a high flying business man who gets his kicks from commercialism, I am a mountain lover living in the Lakes, trying to make a living out of the fells that literally surround me day by day. I value all the opinions of others and thank you for taking your time to comment on my idea, be it positive or not.